Scathing police report accuses foreign observer of purposely creating tensions to justify their existence. The pressure is on to end the mandate for the Temporary International Presence in Hebron. The foreign observer force that has faced controvesry in recent months may not get their mandate renewed at the end of January as they have for the past 20-plus years. Minister Erdan is the latest elected official to call for TIPH's ouster. He commissioned the Israel Police to write a report on the matter and its results were scathing. The disctrict police stated that TIPH "is deliberately creating friction to justify their salaries. The members of the mission confront with IDF troops stationed at permanent checkpoints and disrupt standard inspection procedures of the Palestinian Authority population going through the checkpoints." The report cames after a Knesset conference in January which was attended by scores of Members of Knesset and ministers which praised the Jewish community and decried TIPH. The idea of of foreign observers in Hebron was first conceived in 1994 with TIPH in its current incarnation being deployed in 1997 following the Hebron Accords that divided the city between Israel and the Palestinian Authority. TIPH's stated mission is to "to promote by its presence a feeling of security to the Palestinians of Hebron." For full mission statement visit the TIPH website here. Today, the PA controls 80% of Hebron with 20% being under Israeli jurisdiction. Of that 20% Israeli civilians and tourists are only allowed to access Jewish neighborhoods, except in pre-planned escorted tours. 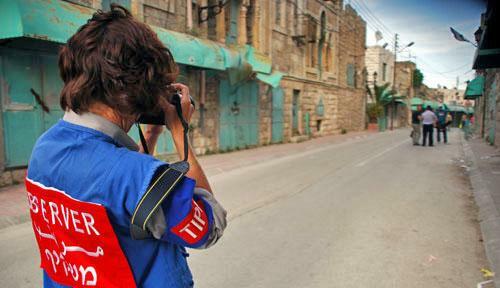 Patrolling the streets of Israel's H2 side of Hebron in their blue vests and white cars, TIPH has 13 local staff and 64 other members who come from contributing countries which include Italy, Norway, Sweden, Switzerland and Turkey. The two incidents that brought TIPH into the headlines this year were the slapping of a ten-year-old and the puncturing fo a car tire. In July, a Swiss member of TIPH toured through a Jewish neighborhood with the provocative Breaking the Silence group, something not allowed according to TIPH's charter. Video footage captured the TIPH member slapping a ten-year-old Jewish boy from the local community in the face. TIPH sent the member back ck to his home country before Israeli authorities could get involved. After the slapping incident, it was revealed that the previous summer, a TIPH member was caught on camera puncturing the tire of a vehicle belonging to a local Jewish family. In his affidavit, Nygaard Solum‎ admitted he had taken ‎part of such ‎cover-ups. "As the financial officer, I investigated fraud ‎allegations against three local employees who were ‎accused of drawing checks from the Arab Bank in ‎Hebron. The case centered around checks that were ‎not delivered to a supermarket that was our main ‎supplier,” Nygaard Solum stated in an affidavit. ‎"The difference was divvied up between the local ‎employee and the supermarket. The procurement ‎officer at the time knew about the fraud but didn’t ‎report it to his superiors, so not as to lose his job," ‎he explained. Nygaard Solum stated that he knew of the incident in which a TIPH member punctured the tire of Jewish resident's car, and that "TIPH’s deputy commander lied ‎to the police and said he didn’t know the observer ‎who did it, when, in fact, he did, in order to ‎protect TIPH." Also, in December one of TIPH's confidential reports landed in the hands of a reporter. Its contents were a scathing indictment of Israel, accusing it of breaking international laws. Rather than shaming Israel, the report created a backlash against TIPH over its bias. There has been tension between TIPH and the PA as well. On March 26, 2002 two TIPH observers, Catherine Berruex of Switzerland and Turgut Cengiz Toytunç of Turkey were killed in an ambush shooting by a Palestinian Arab gunman near Halhul, a city adjacent to Hebron. Three members of TIPH were riding westward on the Trans-Judea highway when they came under fire from short range, although their car was clear marked with the letters TIPH. Huseyin Ozaslan, also from Turkey, who was injured in the attack, related that he clearly saw the attacker, who was wearing the uniform of the PA's security forces and was carrying a Kalashnikov assault rifle. "We shouted that we are observers, members of TIPH," he said. "But he did not hear us and continued to shoot." On February 8, 2006 following an attack on their headquarters by rioting Palestinian Authority residents, all TIPH observers were temporarily withdrawn from Hebron. TIPH members began to resume their duties in April 2006. The TIPH headquarters is located in the PA side of town and members interact regularly with PA officials. * YouTube Playlist - TIPH Biased Against Israel?